Why is the boardwalk orange? 1. Since the boardwalk is made of recycled plastic (like gallon milk jugs), it didn't need to be wood-colored. 2. It's the color of Weequahic High School. 4. Like the orange things you see on a construction site, Newark's riverfront remains a work in progress, with another phase in the works. 7. 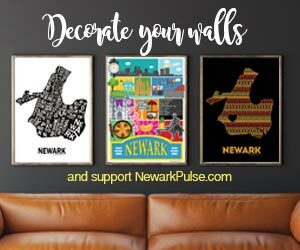 Orange is used in color therapy to induce hunger, and there are many delicious things to eat in Newark, from Brazilian hamburgers to Portuguese dry soups to Southern yams & greens to Caribbean roti to old-school Italian ice cream. 9. Princeton University was founded in Newark, and orange its color. What are the orange sticks? Newark Riverfront Park sits on a sloped site between Raymond Boulevard and the Passaic River, and the sticks, also known as the Dancing Pavilion, are tall enough to be visible from the road and Riverbank Park. How much money did the park cost and where did the money come from? The park's $9 million in costs were raised from over ten sources of funds including $3 million from the New Jersey Hazardous Discharge Site Remediation Fund, $2.6 million from the New Jersey Department of Environmental Protection Green Acres Program, $2.6 million from City of Newark Community Development Block Grant Program, $1.5 million from the New Jersey Urban Enterprise Zone Authority, and the remainder from a mix of other public and private sources. The Trust for Public Land raised more than $2.35 million in private support from The Prudential Foundation, the Geraldine R. Dodge Foundation, Victoria Foundation, and other philanthropists, and Mayor Cory A. Booker raised $850,000 through his GreenSpaces initiative. How polluted is the Passaic River and who is responsible for cleaning the river? The lower 17 miles of the Passaic River, including the entire 10 miles that border Newark, have been declared a federal superfund site by the US Environmental Protection Agency. While short-term contact with the water is not usually hazardous, swimming is not allowed and it is very hazardous to human health to eat fish or crabs from the river. Newark's riverfront parks are located on Raymond Boulevard between Van Buren and Brill Streets in the Ironbound neighborhood, a short walk from Newark Penn Station. They are also served by the New Jersey Transit #1 bus. How do I get involved with Newark's riverfront? Visit www.newarksriver.wordpress.com, email newarkriverfront@gmail.com, call Riverfront Coordinator Chris Caceres at (201) 563-2834, like Newark Riverfront Revival on Facebook, or follow us on Twitter at @newarkriverfrnt.